Will Asian investment follow trade with Latin America? Latin America is firmly on the economic radar of Asia in the post-global financial crisis world economy. 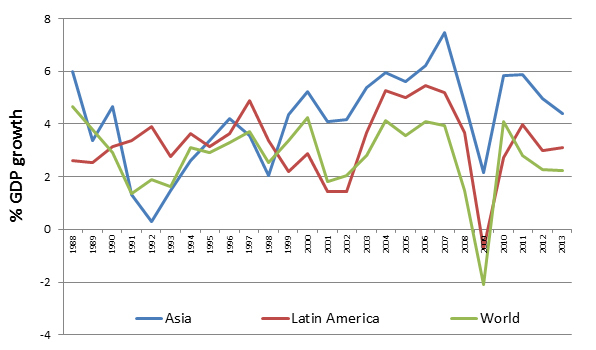 Both Asia and Latin America have grown faster than the world economy. As Figure 1 shows, during 2009–2013, annual average growth was 4.6% in Asia, 2.4% in Latin America, and 1.9% for the world economy. 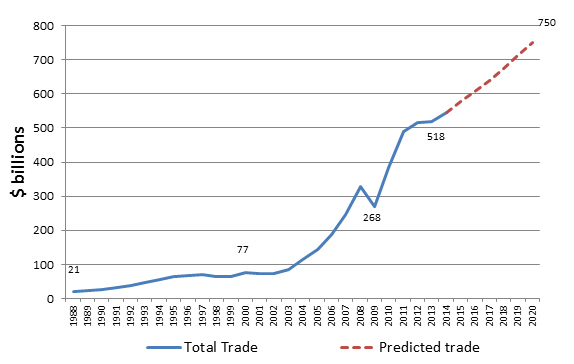 Trade between the two regions has grown significantly, reaching a historic high of over half a billion dollars in 2014 (see Figure 2). This figure is projected to increase to $750 billion by 2020. Increased trade has prompted a flurry of diplomatic activity. In July 2014 the President of the People’s Republic of China (PRC), Xi Jinping, visited Argentina, Brazil, Cuba, and Venezuela. Shortly afterward, Japanese Prime Minister Shinzo Abe visited Brazil, Chile, Columbia, and Mexico. Pledges of trade, foreign direct investment (FDI) and foreign aid accompanied these high-level visits. This represents a dramatic turnaround. Before the 1990s, there was little trade between the two regions. Transport connections between these geographically remote regions were poor and trade barriers were high, resulting in few cultural, diplomatic, and business ties. It takes over a day to fly between Asia and Latin America. Latin Americans largely speak Spanish or Portuguese, which Asians do not. Latin America, whose goods were destined for the giant North American market, used to view Asia as a poor region riddled with economic crises and high risks for business. First, falling trade barriers have fostered specialization according to comparative advantage with land abundant Latin America exporting commodities in return for manufactured goods imports from skilled labor abundant Asia. Second, strong demand for Latin American commodities and food from the PRC and other Asian economies has provided an alternative to declining markets in industrial economies, particularly since the global financial crisis. Third, Latin America has a significant and expanding regional market for Asian industrial goods and FDI. Fourth, advances in information and communication technology as well as better logistics have supported inter-regional trade. Fifth, the spread of free trade agreements (FTAs) across the Pacific has supported market access, rules-based trade, and business confidence.1 The number of FTAs has grown from 2 in 2004 (Republic of Korea–Chile and Taipei,China–Peru), to 9 in 2007, and further to 22 in 2013. At least 25 FTAs are expected by 2020. Tapei, China is Asia’s most proactive trade pact negotiator with Latin America, having concluded five FTAs. Singapore has signed four such deals with Latin American economies, and the PRC, Japan, and the Republic of Korea each have three FTAs. Meanwhile, Chile has eight FTAs with Asian economies and Peru has five. But much needs to be done before Asia and Latin America can reach their full trade potential. The two regions have to increase the number of economies participating in mega-regional FTAs like the Trans-Pacific Partnership, still under negotiation. Their economic ties need to cover more sectors, such as services. Cross-regional policy cooperation needs to be enhanced and structural reforms need to be accelerated. The Asia-Pacific Economic Cooperation (APEC) forum is a useful institution for creating business confidence, but few Latin American economies are in APEC. A newer institution, the Forum of East Asia Latin America Cooperation (FEALAC), agreed in August 2014 to set up a business body to promote cooperation in trade and investment. Brazil, Latin American’s largest economy, especially needs to strengthen ties with Asia, but currently has only one FTA with Asia and concerns have been expressed about its protectionist tendencies. Another key player could be Argentina, if it can sort out its financial crisis and escape going into default. Meanwhile, Mexico, Peru, Chile, and Columbia have formed the Pacific Alliance and are attempting to become more market friendly. Chile in particular has undertaken many reforms and has several FTAs with Asia. Asian FDI can help transform Latin American economies. Asian firms can provide valuable capital and expertise to upgrade Latin American infrastructure. Technology transfer and marketing connections from Asian firms can foster Latin American firms joining global value chains and promote internationally competitive industrialization. Small and medium-sized enterprises (SMEs) in both regions can benefit as suppliers, subcontractors, and service providers to multinationals. However, in contrast to growing trade between Asia and Latin America, FDI has remained lackluster during the past decade. The annual average greenfield investment from Asia to Latin America between 2003 and 2013 was $14.1 billion, while that of Latin American to Asia was only $1.2 billion. 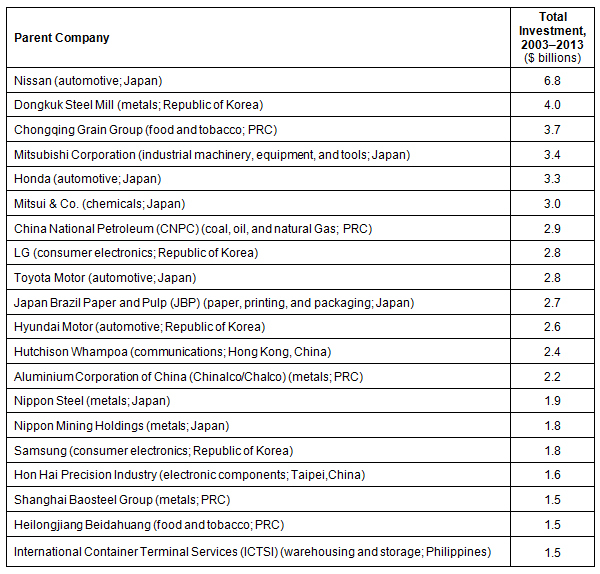 Firms from Asia’s major economies—Japan, the PRC, and the Republic of Korea—account for the bulk of Asian investment into Latin America and such investment reaches a broad range of economic sectors in Latin America, including automotives, machinery, electronics, metals, chemicals, petroleum, and food and tobacco (see Table 1). PRC = People’s Republic of China. Note: Figures cover only greenfield investments. Source: fDi Markets (accessed June 2014). Geographical remoteness, differences in culture and business practices, and domestic regulations in Latin America help explain the low levels of Asian FDI. Cumbersome domestic regulations in Latin America have created an image problem for the region and impeded Asian investment (see Table 2). It takes an average of 47 days to start a business in Latin America compared to 12 days in Asia. 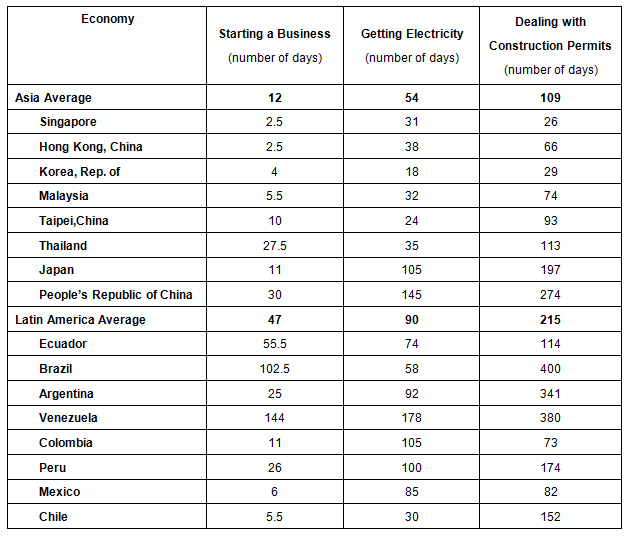 Getting an electricity connection in Latin America takes an average of 90 days compared to 54 days in Asia. Furthermore, it takes an average of 215 days to deal with construction permits in Latin America compared with 109 days in Asia. Some Pacific Alliance members fare better than other Latin American economies on these indicators of the business environment. These economies have implemented economic reforms to boost growth and have expressed an interest in attracting Asian investors. But even they are not as open as some outward-oriented, market-friendly Asian economies like Singapore, the Republic of Korea, and Malaysia. Source: World Bank Doing Business Report (2014) (accessed January 2015). This article first appeared on Asia Pathways and was republished with permission. Ganeshan Wignaraja is Director of Research of the Asian Development Bank Institute (ADBI).